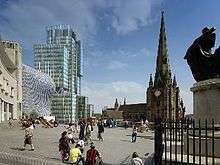 A large part of the scheme was the redevelopment of the Bull Ring, which has been an important feature of Birmingham since the Middle Ages, when its market was first held. It has been developed into a shopping centre twice, first in 1964, but its Brutalist architecture became much disliked by the public and the building was seen as a major part of Birmingham's "concrete jungle" image. 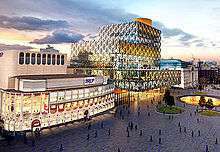 Realising the need for major changes to the city centre, an alliance of investment and development companies was formed called the Birmingham Alliance who put the finance together to design and construct the new £500 million Bull Ring shopping centre, which was completed in 2003. It is amongst the busiest shopping centres in the United Kingdom with 36.5 million visitors in 2004. 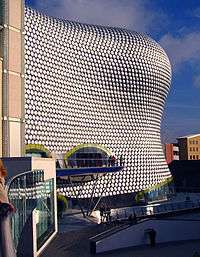 It houses one of only four Selfridges department stores and the largest Debenhams outside London. One Snowhill was the first building in the development. The accountancy firm KPMG has 118,400 square feet (11,000 m2) of office space in the building on a 20-year lease on floors 7 to 11. Following this, Barclays Commercial Bank agreed to move its Midlands headquarters to One Snowhill. They are to take up 98,000 square feet (9,104 m2) of space on floors three to six on a 15-year lease with its own dedicated reception and meeting suite. 1,000 sales and operations staff will move into the office building. The pre-let to Barclays is believed to be the reason why they were comfortable to refinance the loan for the construction of the building. Snowhill One was completed in 2009. 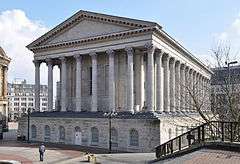 The coalition government has given funding approval for the extension of the Midland Metro from Birmingham Snow Hill Station, passing through the shopping district to Birmingham New Street Station. The £127 million state-of-the-art, electrically powered light rail system will also provide quick and easy access to Birmingham's business district and the Jewellery Quarter. Track laying was due to start in 2013 with a completion date of 2015 however following a number of delays the extension was finally opened on 30th May 2016. The extension is forecast to boost the regional economy by £50 million a year and create up to 1,300 sustainable new jobs. This extension has now been carried out and there are other extensions planned for the future by TfWM. Regal Tower is a proposed skyscraper to be constructed on the corner of Broad Street and Sheepcote Street in Birmingham, England. The proposal consists of a 56 storey tower, measuring 200.5 metres (658 ft) tall, housing retail units, a luxury hotel, residential apartments and car parking. Provision has been made for 256 serviced apartments, although these could become additional hotel space. It is estimated it will cost £125million to construct, and when completed, it will become the tallest building in the city at 200m. The City Park Gate scheme located immediately adjacent to Moor Street Station will deliver over 450,000 sq ft (42,000 m2) of Grade A offices, a 200-room hotel, 250 residential apartments, and 15,000 sq ft (1,400 m2) of retail. The scheme will also include a major new public square. An outline planning application for the development, designed by MAKE architects, received consent on May 10, 2007. Construction is expected to begin in early 2008. 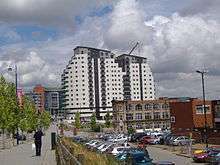 In mid-2010, city planners approved proposals for a nine storey, 174 bed hotel beside the existing Masshouse building. 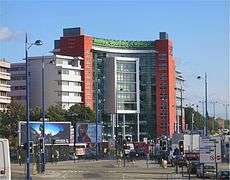 The Hotel La Tour group plans to open the four star in February 2012, creating 100 full and part-time jobs in the area. The development will include a restaurant, bar, gym and conference facilities. Eastside is the proposed location for the terminating station for High Speed 2 (HS2). It is expected that once HS2 is complete journey times from London into Birmingham City Centre will be reduced to 45 minutes with the potential to bring £1.5 billion of investment into the region. 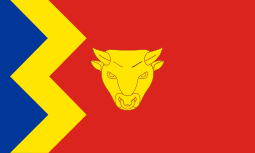 The City of Birmingham Stadium is a proposed multi-purpose stadium in the Saltley area of Birmingham for Birmingham City F.C., to replace the current St Andrews Stadium in Bordesley Green. The original proposal was the centrepiece of a larger scheme to create a £300 million sports village on a 60-acre (240,000 m2) site, however, plans for the sports village fell through when plans for a proposed supercasino for the site also fell through. The stadium plans will rejuvenate a contaminated site currently used by Birmingham Wheels. ↑ "Birmingham Mail report on Stage 2". ↑ "Aerial View of New Street Station 1963". Birmingham City Council. Archived from the original on 2007-09-30. Retrieved 2007-09-23. ↑ "Central Library - from old to new". Birmingham City Council. Archived from the original on 2007-07-02. Retrieved 2007-09-23. ↑ Scrivens, Louise (2003-02-13). "Tackling congestion in Birmingham". BBC News. Retrieved 2007-09-23. ↑ Phil Jones, Urban Morphology Research Group (2002). "Bigger is Better? Local authority housing and the strange attraction of high-rise, 1945-70" (pdf). University of Birmingham. Retrieved 2007-09-23. ↑ Bayley, Stephen (2008-06-29). "Article reviewing the Architectural regeneration of Birmingham City Centre". London: Guardian. Retrieved 25 January 2010. ↑ Reyburn, Ross (2008-12-02). "Article describing Birmingham's Big City Plan". London: Guardian. Retrieved 25 January 2010. ↑ Michael J. Thomas; Peter Brand (2005). Urban Environmentalism: Global Change and the Mediation of Local Conflict. Routledge. ISBN 0-415-30480-6. ↑ "The Birmingham City Centre Masterplan: The Visioning Study" (PDF). Birmingham City Council. Retrieved 25 January 2010. ↑ "Article describing Birmingham's Big City Plan". Birmingham Post. Retrieved 26 January 2010. ↑ "Birmingham Unitary Development Plan Chapter 15 - City Centre" (pdf). Birmingham City Council. Retrieved 2008-01-11. ↑ "Eastside". Birmingham City Council. Retrieved 2008-01-11. ↑ "Designated Areas of the City Centre". Big City Plan. Archived from the original on 24 January 2010. Retrieved 26 January 2010. ↑ Kennedy (2004). Remaking Birmingham: The Visual Culture of Urban Regeneration. Routledge Ltd. pp. 17–18. ISBN 0-415-28839-8. ↑ WSP Group: Birmingham Bullring UK Archived June 20, 2007, at the Wayback Machine. ↑ Re-New Street: Change at New Street Archived December 18, 2005, at the Wayback Machine. ↑ "Work set to start on New Street Station". ↑ Marshall Taylor (2007-06-04). "Ballymore Gains Approval for Birmingham Project". Commercial Property News. Archived from the original on 2008-06-14. Retrieved 2007-12-08. ↑ Neil Nickolds (2008-02-03). "Ballymore ploughs through at Snowhill". Emporis. Archived from the original on 2008-03-15. Retrieved 2008-03-15. ↑ Steve Pain (2008-07-21). "Barclays to move Midland HQ to Snowhill complex". Birmingham Post. Archived from the original on 25 July 2008. Retrieved 2008-07-29. ↑ "Barclays to refinance Snowhill". Property Week. 2009-05-09. Retrieved 2009-08-31. ↑ "Ballymore Gains Approval for Birmingham Project". Skyscraper News. Archived from the original on 12 February 2010. Retrieved 2010-02-01. ↑ "Starwood Hotels announce Birmingham's first 5-star hotel". Europe Real Estate. 2008-01-25. Retrieved 2010-02-01. 1 2 St Chad's Intersection / Snow Hill Queensway roadworks Archived May 17, 2007, at the Wayback Machine. ↑ Edward Chadwick. "Relief for Birmingham as Midland Metro is spare the axe". ↑ "Library of Birmingham". Capita Symonds. Archived from the original on 5 March 2010. Retrieved 2010-02-17. ↑ Robert Booth (2009-04-03). "Library of Birmingham plans unveiled as recession opens a new chapter for civic buildings". The Guardian. London. ↑ Highways Agency Press Statement Archived July 18, 2012, at the Wayback Machine. ↑ "Details Page for Planning Application - 2009/04215/PA". Birmingham City Council. 2009. Retrieved 2009-09-28. ↑ Tower Block Modernism vs. Urban Morphology: An analysis of Lee Bank, Birmingham Archived February 27, 2008, at the Wayback Machine. 1 2 "Eastside City Park - news and information". Birmingham City Council. 2008. Archived from the original on 2008-06-09. Retrieved 2008-11-09. ↑ "Birmingham Beorma Quarter tower block plan panned". ↑ "LSH plays integral role in £15m redevelopment of Birmingham Coach Station". LSH. ↑ "Green light for coach station rebuild". Birmingham Mail. 2006. Retrieved 2006-06-16. ↑ "£150m makeover for Irish quarter unveiled". The Birmingham Post. 2007-08-15. Retrieved 2007-09-20. ↑ "Birmingham's new hospital named". ↑ Fort Dunlop website Archived May 18, 2007, at the Wayback Machine.